More than 35 million Americans suffer from periodontal disease, and heart disease is the number-one killer in this country — and there is growing evidence that there is a link between the two conditions. Recent research has indicated there is strong potential for lowering the risk of heart attack and stroke by targeting periodontal disease. Bacteria and germs that live in the plaque on many people’s teeth cause periodontal disease. The plaque found on teeth is chemically similar to the plaque that builds in arteries, which has been proven to be harmful. The main difference is arterial plaque contains more fat and less bacteria. For some time now, researchers have known that patients with periodontal disease were twice as likely to also suffer from heart disease. The bacteria in plaque that cause gum disease also cause platelets in the blood stream to clump together, thereby raising the risk of heart attack and stroke. The study that discovered this reaction used bacteria samples from patients’ mouths then introduced them to human blood platelets. Other studies have shown that when these bacteria are injected into the bloodstream, clotting occurs almost immediately. We are aware how poor nutrition choices can affect our weight and overall health, but those choices also have a dramatic impact on our oral health. Plaque buildup and gum disease can be devastating, but by making proper nutritional choices we can help prevent both oral problems and heart disease. 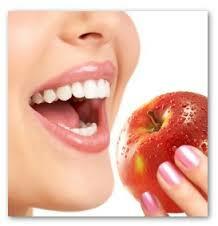 A poor diet promotes the perfect conditions for gum disease to develop. Foods containing high sugar and starches promote the production of bacteria, which can create the perfect environment for gum disease to develop. A diet that is lacking nutrients wears the immune system down, thereby making it less able to fight off infections such as gum disease. Vitamins and minerals provide the body with the tools to build and renew bones, muscles, blood and tissue. Low vitamin and mineral intake weakens gum tissue and bones, making them more susceptible to disease. By making an effort to incorporate the vital nutrients your body needs, you will be helping yourself fight off attacking bacteria all over your body, including your mouth. A body that is fueled properly with a healthy, all-natural diet is better able to fight infection, while a poor diet full of sugars and starches actually promotes infection-causing bacteria. All-natural fruits and vegetables high in vitamin C. Vitamin C is essential for building new cells and therefore promotes healthy gum tissue. Minerals like magnesium and zinc found in all-natural fish, poultry and lean meats, these minerals promote healthy bones, including the teeth. Raw, crunchy vegetables such as celery, carrots, and onion. Crunchy vegetables clean the teeth and massage the gums as you eat them, providing a cleaning service along with healthy nutrients. All-natural/ organic fruits, vegetables and lean proteins are recommended because they contain substantially less chemicals, pesticides, dyes, steroids and hormones — all of which have been shown to, at a minimum, aggravate gum disease and heart disease. Recommended heart-healthy supplements include Omega-3 fatty Acids from flax seed, fish, or krill oil, and a high quality multivitamin. Make sure a company manufactures them with NPA’s certification for good manufacturing practices. Your dentist may recommend additional supplements. Obviously foods such as pastries, cakes, sweets, chocolate, sweetened fruit juices and fizzy drinks are the types of food that do not help in preventing gum disease. Foods with a high sugar and starch content remain on the teeth for a long time, thus providing a breeding ground for bacteria that thrive on the sugars. When a poor diet is coupled with a poor oral hygiene routine, these harmful bacterial continue to thrive and can eventually lead to gum disease. However, a consistent, healthy eating plan rich in vitamins and minerals, fruit, vegetables, fiber, and lean protein has been shown to help prevent plaque from developing in both the arteries and on teeth. It is vital that you brush your teeth at least twice daily — after breakfast and before bed — without fail. You should also floss once daily, preferably at night, to clear the little areas between your teeth of harmful food particles that produce bacteria. This ensures that plaque buildup is kept to a minimum, thus lowering your risk for gum disease and heart disease. You should also drink plenty of water during the day to keep your mouth moist and able to clear away food particles before they have the chance to damage your teeth. We recommend at least half your body weight in ounces of plain water daily. There is no better prevention for any dental problem than a good dental hygiene routine. This means maintaining a healthy, all-natural diet rich in vitamins and minerals, fiber, lean protein, fruits, and vegetables, and scheduling regular teeth cleanings and checkups with your dentist.